I recently began to change all my baking items over to Organic because everything I read told of how bad all foods grown with pesticides, chemicals and hormones were for you. I had already avoided a lot of meats because of the hormones for many years. As time goes on I get more and more particular about buying organic only. Your health is greatly affected by what you put into your body and children are at a greater risk from all the chemicals and hormones in our foods. Their bodies are so much smaller than adults and it’s harder for them to process all the bad stuff. I have a Vitamin D deficiency and in speaking to my doctor about how to prevent this she said there was a recent study that conventional foods instead of organic block your body from absorbing the Vitamin D your body needs. A lot of what you read tells you to go out in the sun without sunblock for periods of time because it’s the best way to get Vitamin D. I lived in Hawai’i and was in the sun all the time and still had this deficiency. So, I’m more determined to have a diet that is completely organic. Recently in my search to find something more on the Vitamin D and Organics I came across a very interesting article on Organic Strawberries that shows how much better they are in taste and health benefits. I don’t think I’ll ever buy a strawberry again unless it’s organic. 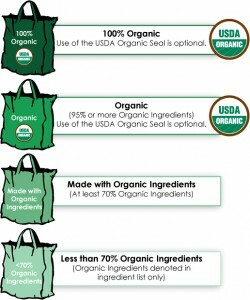 Look for the USDA organic seal on raw, fresh products and processed products that contain organic agricultural ingredients. Or it may appear on a sign above an organic produce display. On multi-ingredient products, the seal is usually placed on the front of the package (principal display panel); however, it may be placed anywhere on the package. When you see this seal, you know the product is at least 95 percent organic. The seal may be printed in green and brown (as shown), in black and white, or outlined in black on a transparent background. We’ve done a lot of shopping at Whole Foods and Central Market now that we live in Austin and can get a good selection of Organic Products. It can get expensive as I paid nearly $8 for a bag of Organic Whole Wheat Flour the other day at the regular grocery store. I noticed it was only about $4 at Whole Foods so planning your shopping is a good idea. I can get a lot of my baking staples at Costco now in Organic. They carry sugar, white flour, eggs and many of the dried fruits and every time I go in the store it seems more and more organic items have been added. I bought Flax, Figs and Raisins last week. So, my advice going organic is to convert everything new you buy for your kitchen to organic when it’s available, especially foods you consume a lot of. And when reading articles on the internet about organics and other health related items check the source and the dates of articles. Some stuff out there is opinion articles and many were from five or more years ago. Science is constantly evolving and we learn more every day.